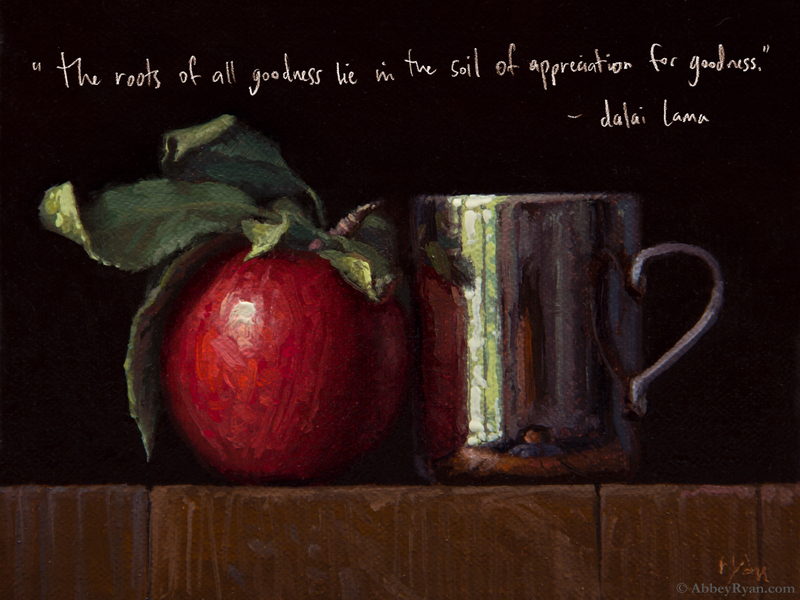 Abbey Ryan - Free Poster/Wallpaper - "The roots of all goodness lie in the soil of appreciation for goodness." Abbey Ryan - "The roots of all goodness lie in the soil of appreciation for goodness. ~Dalai Lama"
This poster is completely free to download. Click here or click on the image below. Enjoy. Join 31,000+ others receiving my free giveaways and special offers, and you'll also be the first to see my newest paintings. Sign in here. It's FREE. Still Life with Apple & Silver Cup (A Meditation on 8 Years), 5x6 in., Private Collection. Download your desktop wallpaper here.